Sweet chocolate is one of the few sweet flavors that I really go crazy for. 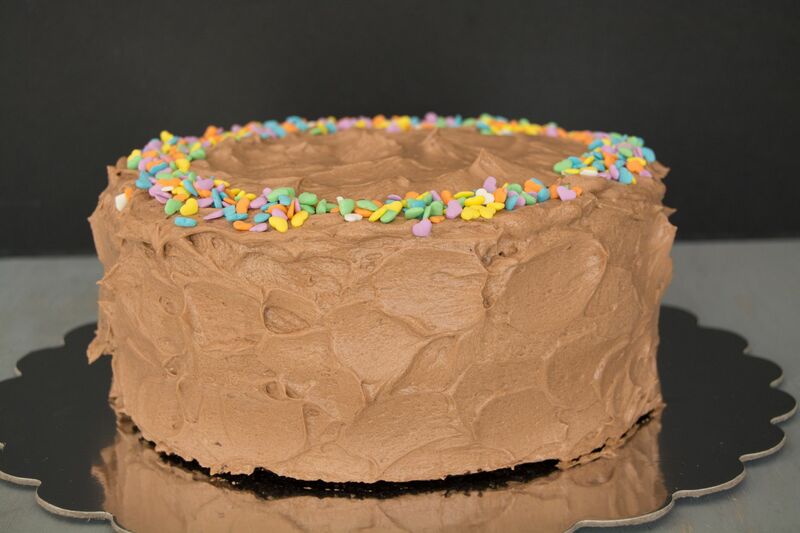 I simply love it, especially if it’s a chocolate cake covered with chocolate buttercream. Sometimes I put it in the microwave for about five seconds and it’s just the most delicious thing I could eat. 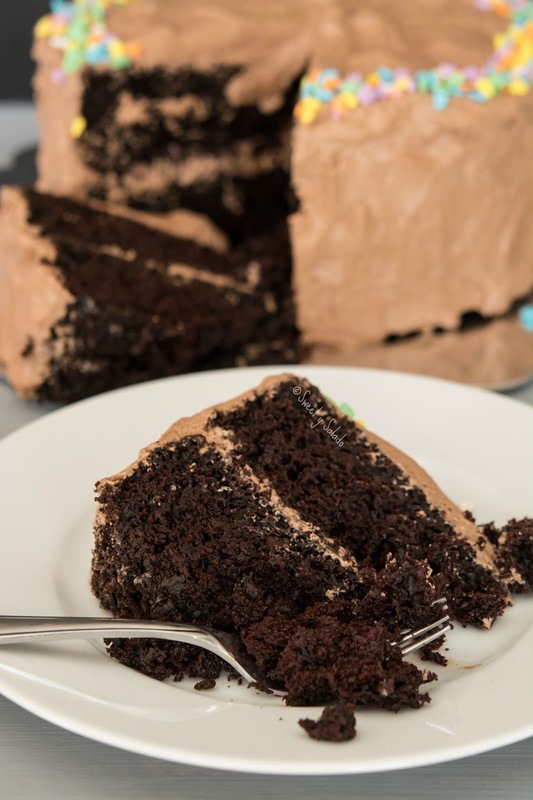 And apparently my followers feel the same way because even though I already have three other wonderful chocolate cake recipes (Chocolate Cake With Chocolate Ganache, Chocolate Tres Leches Cake and Chocolate Cupcakes) they keep asking for more variations. So here is one more version that I am sure you will love. It is a little different from the other versions I have made because it is made with vegetable oil instead of butter and this gives you a softer and fluffier texture. 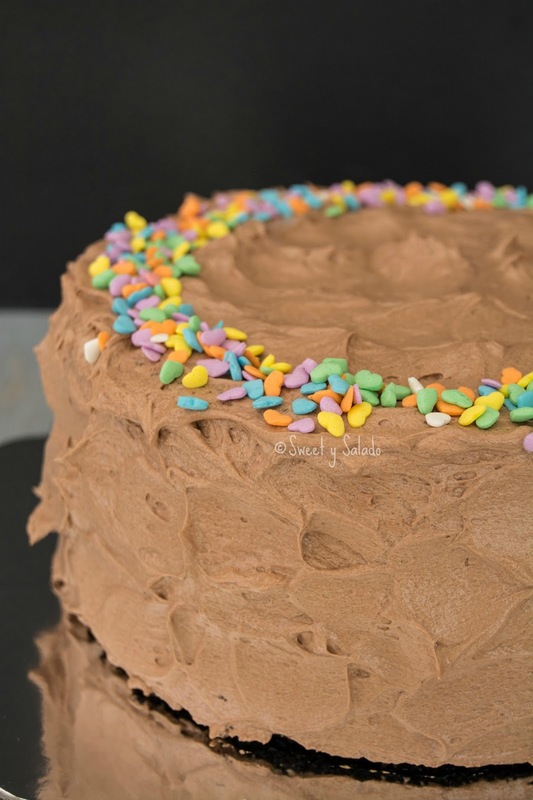 I also used the chocolate buttercream frosting that I have on the blog to frost it and it came out fantastic. Another recipe that you keep requesting is chocoflan and I promise I will post it on the blog before the end of the year. It’s so simple that you can simply use one of the chocolate cake recipes I already have on the blog with the flan recipe that I also posted last year and voilà, you have chocoflan. Sift flour, cocoa powder, baking powder, baking soda and salt into a large mixing bowl. Add the sugar and mix to incorporate. In a separate mixing bowl beat the eggs, milk, oil and vanilla extract. Add the egg mixture into the dry ingredients and mix to incorporate. Slowly add the boiling water while still mixing and then scrape the inside of the bowl with a spatula to make sure everything was mixed well. Pour the batter into two 9 inch (23 cm) or three 8 inch (20 cm) round baking pans that have been greased and floured. Tap a few times to get rid off the air bubbles trapped inside the batter and bake for about 30-35 minutes or until a toothpick inserted in the center comes out dry. Let the cakes cool on top of a cooling rack for about 10 minutes. Then, take the cakes out of the baking pans and let them cool completely on the cooling rack. 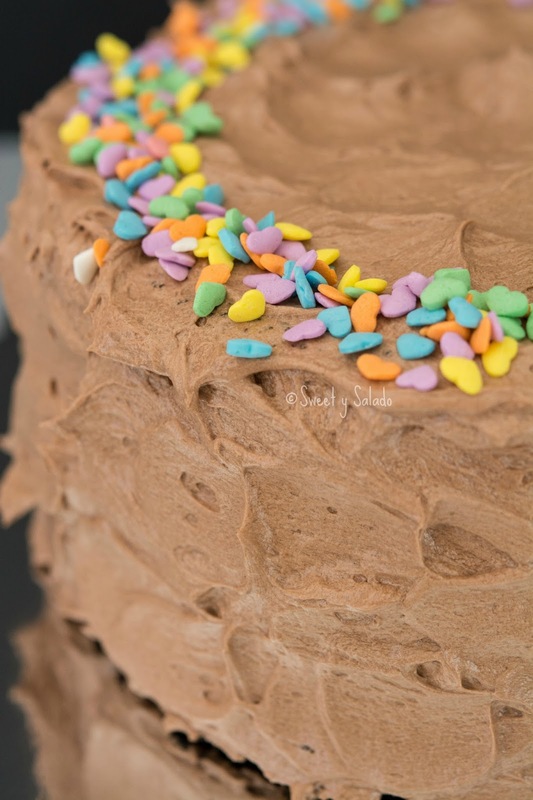 Once the cakes are cool you can frost them with the chocolate buttercream frosting or any frosting of your choice. Very Nice Blog. Thanks for sharing such a nice recipe with us. Chocolate is always my favorite flavor in all options. I am always ready for chocolate cakes. We have one best shop in NYC NYC Cake Shop from where I am getting my favorite cake.